These lamps definitely don't dissapoint a room.I couldnt be happier with this and all my past and future purchase with overstock! Sleek and retro Mid-Century modern style encompasses this brown faux crocodile print lamp from Safavieh. Its pillar-shaped design adds unparalleled texture and dimension to any room. Providing ample luminosity with its two-light design, this lamp is perfect by the bedside, in a home office, or in the living room next to a favorite lounge chair. 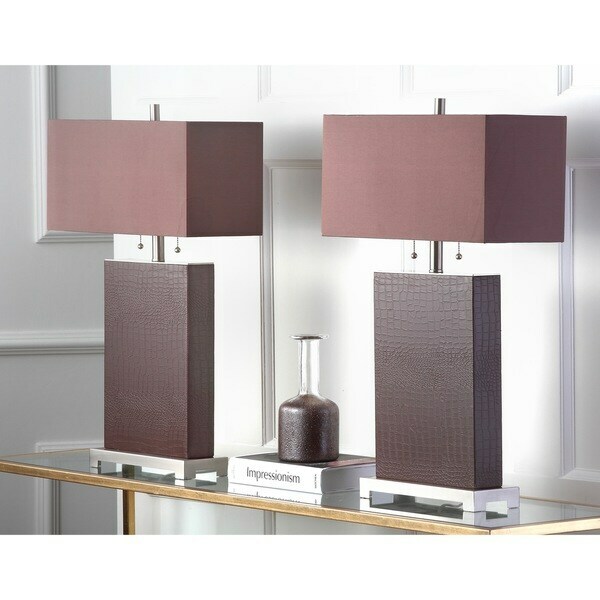 The lamp features a coffee brown hardback silky shade and a chic crocodile print rectangular body that ultimately rests on a satin-finish metal base. Available in a set of two, this gorgeous lamp works well in pairs for spouses, or as accents in separate areas of the home. The final touch, the silver pull chains, make these lights easy to turn on and off, even in the middle of the night. Dimensions 29.5 in. H. x 8 in. W. x 18 in D.
Deep Chocolate brown faux alligator skin. Lamps are thin to med thick like a book with a large square shade. Much larger than expected. Double pull chains. Lamp has silver accents. Very expensive looking lamp. Wow. 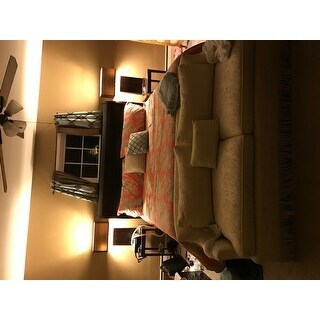 I'm a professional real estate home stager and purchase a tremendous amount of furniture and accessories. We are always buying lamps but these are my favorite to date. Sophisticated, slightly masculine, contemporary, larger scale and just plain impressive! The color, dark brown, is a nice change too. Not to mention a great buy. You can't go wrong with these. I highly recommend these lamps and will continue to look at more pieces by this manufacturer. I was a little nervous because I bought the lamp THEN read the reviews . There were people who received damaged/broken lamps. I was lucky I guess because my lamps arrived in tact without any damage. They were so easy to assemble I didnt even have to wait on my husband to get home to do it, which is the case with most things. They are large, pretty bold statement pieces. To me they were worth the price. Yes the packaging was a bit "much" but I would rather they over do it on the packaging to ensure damage free shipping. These lamps are beautiful. These lamps are gorgeous and give off a beautiful glow. The packaging was extreme and it was more of a task unpacking these lamps then it was setting them up. There was so much styrofoam which disintegrated and fell apart trying to remove the lamps, shades, and finials. I was chasing little styrofoam pieces all over the bedroom. Large, impressive lamps. They are very well packaged and arrived in perfect condition even with the large shades. The croc print leather is nice and not cheap looking,. Oh my God! 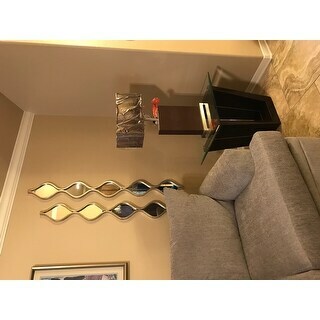 when I received the lamps i was so pleased, They look so beautiful in my room , very expensive looking lamp for such a great price, the lamps comes with two extra light bulbs, " beautiful lamps"
I like the color and quality of these lamps perfect for the price .I would definitely recommend this item. So Nice! Slender, Tall &amp; Classic, Clean Lines. Went together so easy, all parts were packaged well. Look Amazing. Great Price for a Set! Highly recommend. Had 3 years now. Nice lamps. Look cheap in person. Gave them away versus sending back. Not recommended. I really like the lamps and I am especially found of the the double lighting. I just wish the lamp shades were more substantial. I love the lamps it was an instant upgrade to my bedroom...Beautiful stylish and contemporary! Beautiful Lamps!!! Just received them yesterday. The lamps and their color look exactly how they are on the site. They are very sturdy and built of good quality material. I would definitely recommend. However, I am just not sure if they flow with my decor otherwise they are an excellent choice. These are beautiful lamps! I have never seen such a lamp of of this texture. I thought that they would look in my livingroom, I was wrong they are going to look great in my livingroom. The color is a chocolate but not to deep of a chocolate texture. The alligator texture is on point. I would purchase these again if I every broke them. These were really classy lamps at an excellent price. Very up to date. 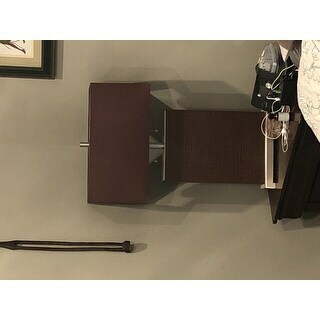 I ordered these table lamps to go along with my alligator leather bed, I bought in the Middle East and it fit perfectly. Although there not leather, you really don’t know that until you get up close and touch. It adds just the correct amount of ambience to the bedroom. I simply love love these lamps. "What are the dimensions of the lamp shade?" The shade dimensions are 9”H, 18”L and 8”W. "What type of light bulbs does this lamp take? Incandescent or compact fluorescent?" You can use any type of lightbulb with a standard base. The lamps come with fluorescent bulbs, but I have used incandescent, as well. "I am curious about the color. I saw someone mentioned they are more rust but the description says brown. Brown would work for me but not rust." I bought these for my son. His are definitely brown not rust. Really nice texture too. I have a pair of these and really like them. The brown leather print on them does have a red tone but i would not say they have the orange that rust has in it. Good Luck. "I have these lamps, can I buy replacement lamp shades only? Laurie Andrade"
Hello firemansfire, we do not sell replacement parts for these lamps at this time. We recommend contacting the manufacturer regarding replacement lamp shades if possible. Thank you for shopping with us. "Do you expect to have these back in stock, and if so, when?" Hello doreyn, items are restocked as they become available; however, we cannot guarantee an item will be restocked. Thank you for shopping with us. Thought they would look nice with my leather sofas. "also, do these shades allow for light to pass through well? Or does the light shine more above & below the shades? Thanks again"
Hello India, thank you for your inquiry. Unfortunately, the information you have requested is currently unavailable. You will receive an email notification once an answer is posted. Have a great day.